Next month I will pedal 100 miles in Amelia Island FL to help eradicate T1D. I can keep talking about the importance of better treatments, treatments like the Artificial Pancreas which I have helped test. I can tell you about the absolute necessity to advocate for Medicare to include CGM coverage. 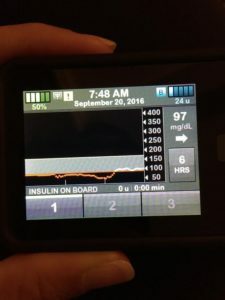 I can tell you about insurance companies removing the choice from T1Ds to choose their type of insulin pump (and why that’s wrong). I can give you a bevy of reasons to help in this crusade to fundraise and advocate, BUT I already have. Last year, my bike “Piñata Bike” was brightly covered in the names of all my donors. When I didn’t finish in Burlington and kept training in secret for Tucson, THOSE names were my greatest motivation to never quit. Those names traveled with me across the country and were my focus on every ride, when I thought my legs would quit. You don’t have to pedal 100 miles, but you can be right there with me on my ride (no literally, my bike). 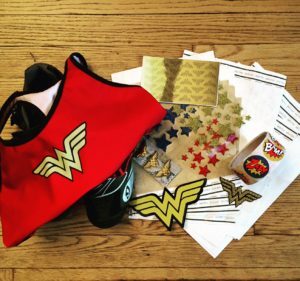 All donors names will be back on the bike this year a la Wonder Woman cuff style (think glittery stars). Any donation $100 and above will get a special Wonder Woman gold sticker with their name. Insulin pump tubing = Rope of Truth? You betcha! Keeping the FUN in Fundraising!